The Christmas of 1932, the year my father died, was a snowless Christmas and not as cold as one would expect at that time of year. In mid-afternoon of Christmas Eve, my brother Joe, my sister Olga and I were sitting on the front steps of our rundown house, which was badly in need of a paint-job, doing nothing in particular except talk about Christmas. When I mentioned I hoped Santa Claus would bring me a hockey stick and a snakes & ladders game, Olga piped up: "Santa Claus doesn't come to poor people's houses." This shook me to the core. "How come? "I exclaimed. "Because," Olga answered, "He just doesn't come to poor people's houses." Blunt, but true. Strangely, for a lad as young as I was (9) I thought about it for awhile, and then came to terms with it. "If that's the way it is, then that's the way it has to be," was my outlook. While we sat there in cheerless conversation, a truck drove up and stopped in front of our place; a man came up the sidewalk and thrust out a clipboard with a sheaf of papers on it for Olga to read. He pointed a finger at a name thereon and asked if this family (ours) lived here at 1554 Parent Avenue, to which Olga nodded assent. The man turned about and hollered to the two men standing amidst a load of bushel baskets, "Okay, fellows, let's go!" Three men carrying two bushel baskets full of groceries, candies, and other Christmas goodies, along with a large basket of meat and a plucked goose started up the sidewalk. With the excitement only kids our age could display at being handed something good and special, we followed Olga as she directed the men around to the back entrance. The largess was deposited on the kitchen floor, to the surprise and tearful enjoyment of my mother. The Goodfellows of Windsor had come through at the last minute and delivered Christmas to the Scislowski/Hedgewick household, precisely when the prospects of a Merry Christmas appeared so bleak. Some kind soul in the neighbourhood had submitted our names to the Goodfellows, and we were well on the way to having a Christmas celebration that would be enhanced by events in the wee small hours of the morning when we were tucked away in our feather-tick covered beds sound asleep. Since Olga had said Santa would not be stopping at our house, I had no intention of waking up bright and early on Christmas morning. We had no tree set up and no decorations anywhere in the living or dining rooms. It would be just another day for us except for the traditional Christmas goose dinner with all the trimmings my mother could now prepare for us. And so, on Christmas morning while I was deep in some dream long since forgotten, my brother Joe brusquely shook me awake, "Stan, Stan, come and see what Santa brought you!" It took a few seconds to get my wits about me before I leaped out of bed, almost ran into the Quebec heater (an upright wood and coal stove) and entered the living-room or front room, as we called it. Before my dancing eyes floated balloons and multi-coloured garlands hanging from the ceiling. But best of all, a three-foot decorated Christmas tree set up on a table in the corner, with brightly wrapped boxes of gifts from Santa around it! I literally jumped out of my skin when I spied the hockey stick standing by the table with my name on the tag, "To Stanley, from Santa". And, yes, there was also a Snakes & Ladders game. To say our household was filled with excited shouts and squeals of delight and merriment was to describe it in the mildest of terms. It was joy beyond joy and it had arisen out of adversity. The Christmas tree, the presents and decorations had come from the hearts of my oldest sister Annie and my oldest brother Peter, both of whom somehow put enough nickels, dimes and pennies together from their meager earnings; Annie from her house-cleaning jobs and Peter from his door-to-door selling of Postian rugs and Kirby vacuum cleaners, and what he made at his caddy jobs in the summer. 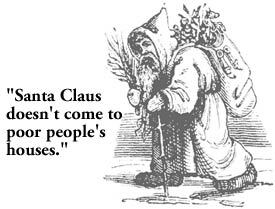 And that is what they must mean when they talk about the magic of Christmas. Each year, the Goodfellows of Windsor deliver their magic to poor children. The item that made Christmas joyful and bounteous to us came in the shape of a red net stocking filled with trinkets, nuts, fruits and candies. Down in the toe nestled a small box about two inches square, spangled with such brilliant colours that when you moved it, it made your eyes jump. The red, green black, and gold foil pattern caused an optical illusion when you shook it to hear the opulent sound of ten gleaming new copper pennies inside. A person was suddenly rich as Croesus and the box became a toy in itself - a treat for the eyes! 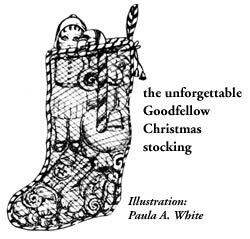 The Goodfellows even managed to include one of those jumbo peppermint canes you don't see any more, and there were tiny gilt bells where the drawstring tied at the top of the stocking, so you could hear real music when you wiggled it and set the "fairy bells" a-ringing. Corky Deir Rawson was born on a farm near Chatham in 1926. Her family moved to Windsor in 1929 where her father established a construction business. They lost everything in the crash of '29 and several years later, when Corky was suffering from malnutrition, the family moved to a farm near Port Stanley so she could regain her health. After a stint of modelling for department stores such as J. L. Hudson in Detroit, Corky turned to writing. In addition to Border City Sketches, a collection of her memories of Windsor, Corky produced a series of children's books. She also wrote, hosted and produced several radio and TV programs.